With the exception of certain viruses, DNA rather than RNA carries the hereditary genetic code in all biological life on Earth. 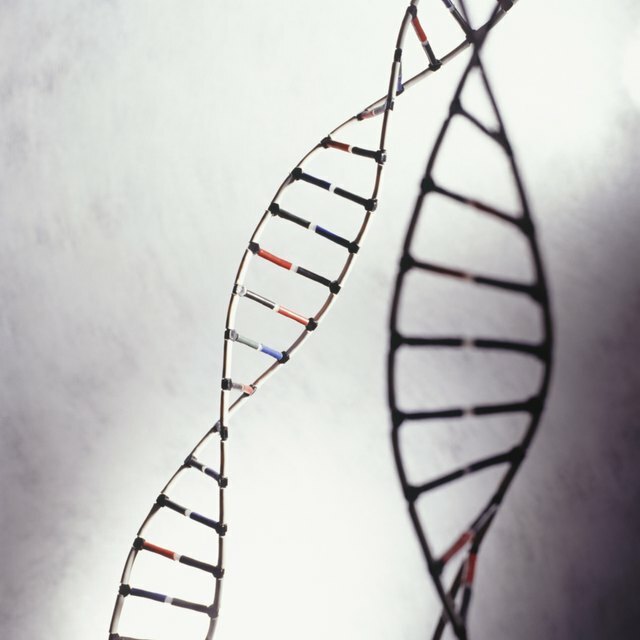 DNA is both more resilient and more easily repaired than RNA. As a result, DNA serves as a more stable carrier of the genetic information that is essential to survival and reproduction. Both DNA and RNA contain the sugar ribose, which is essentially a ring of carbon atoms surrounded by oxygen and hydrogen. But whereas RNA contains a complete ribose sugar, DNA contains a ribose sugar that has lost one oxygen and one hydrogen atom. Fun fact: This minor difference explains the different names assigned to RNA and DNA – ribonucleic acid versus deoxyribonucleic acid. The extra oxygen and hydrogen atoms in RNA leave it prone to hydrolysis, a chemical reaction that effectively breaks the RNA molecule in half. Under normal cellular conditions, RNA undergoes hydrolysis almost 100 times faster than DNA, which makes DNA a more stable molecule. In both DNA and RNA, the base cytosine frequently undergoes a spontaneous chemical reaction known as "deamination." The result of deamination is that cytosine changes into uracil, another nucleic acid base. In RNA, which contains both uracil and cytosine bases, natural uracil bases and uracil bases that resulted from deamination of cytosine are indistinguishable. Therefore, the cell cannot "know" whether uracil should be there or not, making it impossible to repair cytosine deamination in RNA. DNA, however, contains thymine instead of uracil. The cell identifies all uracil bases in DNA as having been the result of cytosine deamination and can repair the DNA molecule. The double-stranded nature of DNA, as opposed to the single-stranded nature of RNA, further contributes to the favorability of DNA as the genetic material. The double-helix structure of DNA places bases inside the structure, protecting the genetic information from chemical mutagens -- that is, from chemicals that react with the bases, potentially changing the genetic information. In single-stranded RNA, on the other hand, the bases are exposed and more vulnerable to reaction and degradation. When DNA is replicated, the new double-stranded DNA molecule contains one parent strand -- which serves as the template for replication -- and one daughter strand of newly synthesized DNA. If there is a base mismatch across the strands, as often happens after replication, the cell can identify the correct base pair from the parent DNA strand and repair it accordingly. For example, if at one nucleotide position the parent strand contains a thymine and the daughter strand a cytosine, the cell "knows" to fix the mismatch by following the instructions in the parent strand. The cell will therefore replace the daughter strand's cytosine with an adenosine. Since RNA is single-stranded, it cannot be repaired in this way. Biochemistry Revisited: Why Is DNA (and Not RNA) a Stable Storage Form for Genetic Information? NSTA Webnews Digest: WHY Did Mpother Nature Use Uracil to Replace to Replace Thymine in mRNA...? Medic Guide: Why Is DNA Double-Stranded, but RNA Single-Stranded? Graw, Michael. "Why DNA Is the Most Favorable Molecule for Genetic Material & How RNA Compares to It in This Respect." Sciencing, https://sciencing.com/dna-favorable-molecule-genetic-material-rna-compares-respect-17806.html. 13 March 2018.